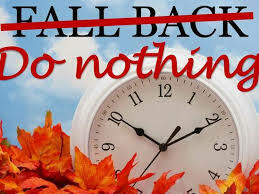 Ever think about making Daylight Saving Time Year-Round? I heard of this option this weekend, what do you think of it? This option is growing in popularity it seems. Just think of all the advantages of eliminating Daylight Savings Time, but allow us to have some sunlight after work instead of before—when we would probably just use it to sleep. Advantages: More people would get more sleep, which could prevent the workplace accidents and auto collisions which result from tired and weary people operating their machinery after a work shift. And since cars tend to injure more people after dark, having DST all the time would mean that people would enjoy more light for evening drives, which could lead to a decrease in accidents, and save an estimated 366 lives every year. Farmers wouldn’t have to subject cows to an arbitrary change in milking schedule. We’d get more light at a time when we’d more likely use it for something other than sleep. Disadvantages: Of course students would have to go to school in the dark (assuming school hours stay the same), and farmers would have to get up really early to get the milk and eggs collected in time for the next steps of the supply chain. “Morning people” (whoever they are) might not like the change all that much. Every October, candy beckons us all. But exactly how did the "spooky holiday" become the candy month? According to the California M ilk Processors Board, "an average Jack-O-Lantern bucket carries about 250 pieces of candy amounting about 9,000 calories and about three pounds of sugar." Just 100 years ago, Halloween looked quite different from the candy debauch of today. The biggest difference was trick-or-treating. This seemingly timeless custom is actually a quite recent American invention. The ritual of costumes, doorbell-ringing, and expectation of booty appeared for the first time in different locations throughout the country in the late 1930s and early 1940s. It wasn't until the late 1940s that trick-or-treating became widespread on a national scale. And even then, candy wasn't the obvious treat. Kids ringing a stranger's doorbell in 1948 or 1952 received all sorts of tribute: Coins, nuts, fruit, cookies, cakes, and toys were as likely as candy. In the 1950s, Kool-Aid and Kellogg's promoted their decisively non-candy products as trick-or-treat options, while Brach's once ran ads for chocolate-covered peanuts during the last week of October that didn't mention Halloween at all. It took a while for candy to become the very essence of Halloween. Going back even farther to the early decades of the century, before trick-or-treating spread across the land, candy didn't have any special role to play in Halloween observance. There’s a lot of spooky and even ridiculous things that people believe about Halloween. While the jury is still out on whether Pennywise actually walks around in our storm drains, there are a few things that USA Today says simply aren’t true. Myth number 1: People are poisoning your candy. Despite claims of poison, razor blades and LSD being planted in candy over the years, there has only been one proven case of candy poisoning and that was back in 1974. Myth number 2: Black cats are in danger of being killed or sacrificed. The ASPCA says, "while it is true that animals too often become the victims of holiday pranks and cruelty, there is no reason to believe that witches are involved. Myth number 3: Halloween is all about pumpkins. Halloween historian, Nicholas Rogers, says jack-o-lanterns were initially carved from turnips, with a candle put inside to represent a soul trapped in purgatory. Finally, myth number 4: The Legend of Sleepy Hollow is a Halloween story. It's not. Washington Irving’s novel never mentioned Halloween at all. The holiday wasn’t even widely celebrated at the time. Although it is fair to say a headless horseman is terrifying no matter what the season. A 40,000-pound boat has a lot of momentum. Like most large powerboats, however, it has two powerful engines to make maneuvering in tight spaces relatively easy, unless, of course, something fails. This boat's owner was in the process of docking and pulled back on the throttle to reverse the starboard engine. To his surprise, it didn't respond and continued moving slowly forward. Unable to control his boat in the confines of the narrow dock, all it took was a scant few seconds to do $15,000 damage to two nearby boats. 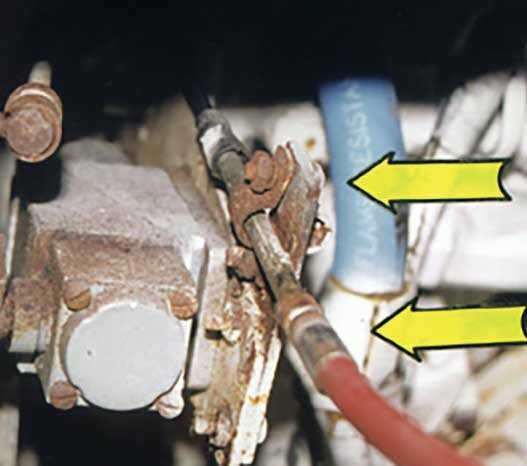 Later, it was found that a small nut that secures the starboard engine's shift cable had loosened, allowing the cable to slide out of its bracket. An unsupported cable, as the owner found out, is useless. If you haven't done so already, make sure these brackets are part of your routine maintenance inspections. According to the BoatUS Foundation, tests showed that the label "biodegradable" doesn't mean much when it comes to boat soaps. Technically it means that the ingredients break down into harmless components when they go through typical wastewater treatment, but we know that likely won't happen with boat soaps. So while the label sounds nice, it doesn't mean much. Also, the results of the Foundation's tests varied greatly: One soap labeled "biodegradable" can be hundreds of times less degradable than another with the exact same label. When using boat soaps, those products that say "dilute with water in a bucket" are much less toxic than those products that are applied as a paste or a spray. When you have a troublesome spot, use one of the spray or paste cleaners, but wipe up with a rag instead of rinsing into the water. The best general advice is to wash your boat on the hard, away from the water's edge. If you must clean your boat in the water, we recommend frequent freshwater rinsing to minimize the buildup of dirt. Tampa Bay, the state's largest estuary, has some of the best boating in Florida. Downtown Tampa has fine restaurants and hotels, as does the City of St. Petersburg, a short cruise across the bay. But it is the hidden bays and rivers that are the true treasure of this metropolitan boater's paradise. Anchor up near Beer Can Island or Shell Key or cruise out to Egmont Key and explore the ruins of a 19th Century army fort. Although this park is primarily a wildlife refuge, it can be a personal refuge - a place to relax and collect shells along secluded, pristine beaches. Accessible only by private boat, Egmont Key has a unique natural and cultural history, including a lighthouse that has stood since 1858. During the 19th century, the island served as a camp for captured Seminoles at the end of the Third Seminole War and was later occupied by the Union Navy during the Civil War. In 1898, as the Spanish - American War threatened, Fort Dade was built on the island and remained active until 1923. After touring the historic sites and trails, visitors can enjoy swimming, fishing, wildlife viewing, and picnicking. Located at the mouth of Tampa Bay, southwest of Fort DeSoto Beach. Due to remote nature of the island there is no drinking water on the island and there are no stores. So please remember to bring water, food and sunscreen when youi visit. It is just a short run up Pinellas county's sugar-sand beaches to Caladesi Island, one of a few state parks that has docking facilities, and nearby Three Rooker Bar and Anclote Key, two wild barrier islands that are both havens for boaters. Head south out of the mouth of Tampa Bay and it is just a short run to Anna Maria Island and Sarasota, another Gulf Coast city that caters to cruisers.